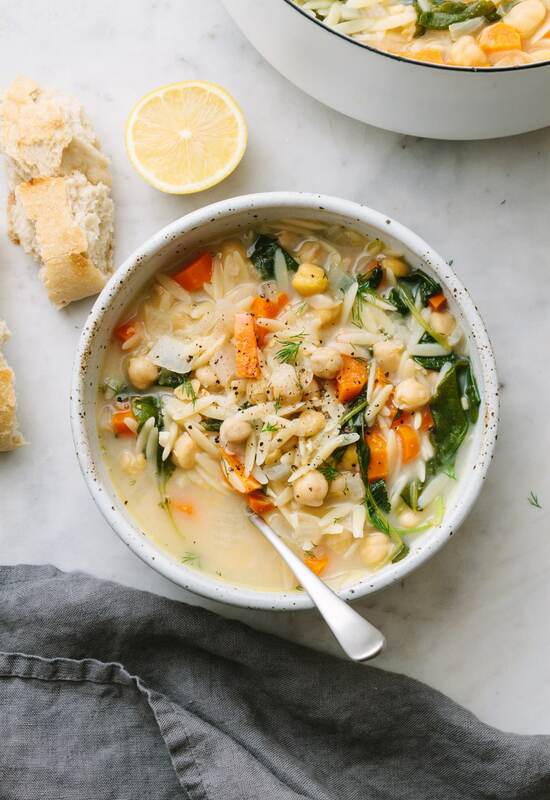 Wrap your hands around a bowl of this hearty, vegan Lemon Chickpea Orzo Soup! 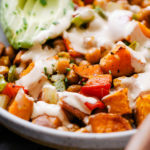 It’s brimming with chickpeas, orzo, carrots, kale (or spinach), lemon, dill, plenty of mineral salt and fresh cracked pepper, and made creamy with tahini. 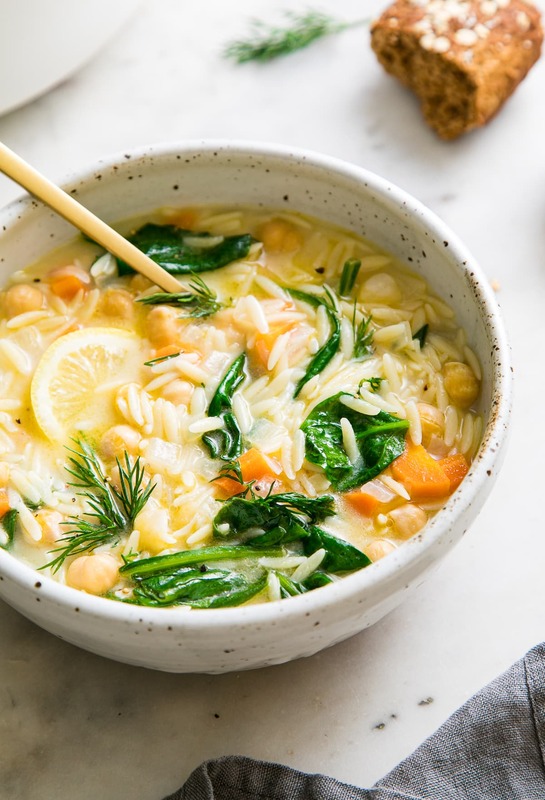 This simple Greek inspired lemon orzo soup recipe with chickpeas and dill is healthy, super easy to make and will be ready in 30 minutes! I love anything with orzo, which is a pasta shaped like a large grain of rice. 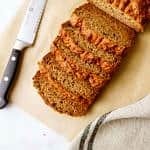 It cooks up tender and delicious, and it works so well in soups and salads. You can find this other vegan orzo recipe, Mediterranean Orzo Salad, in the archives for another way to use this delicate, yet hearty, pasta. And one of my favorite parts about this soup is the freshly squeezed lemon juice. The lemon brightens up the soup adding pure comfort in a bowl with a hint of refreshing, lemony broth. This is one hearty, healthy, clean-eating, delicious soup that I know you’re going to love! The tahini adds a delicious buttery creaminess. If you don’t have tahini on hand, this soup will still be fantastic without it! 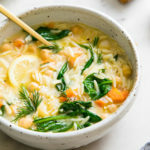 The inspiration for using tahini comes from the Greek soup called, avgolemono, which adds eggs stirred in at the end of cooking to thicken the soup. 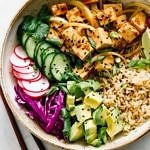 The tahini does this well, making a vegan version of this classic mediterranean recipe. Soup thickens upon standing. For the broth, I prefer to use a combo of half broth and half water. To keep the sodium to a minimum, source out low-sodium vegetable broth. 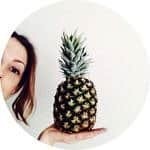 I almost always use this organic vegetable broth concentrate, and for this recipe I would add about 1 teaspoon to 4 cups of water, along with 3 – 4 cups of plain water. It works well, without losing out on too much flavor. The herbs can be changed up to suit your taste. If you don’t care for dill, try using rosemary or oregano. 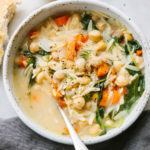 Replace the orzo with rice for a gluten-free soup by adding 2 cups cooked rice in place of the orzo, and reducing the liquids to 6 cups, adding more liquids as needed. 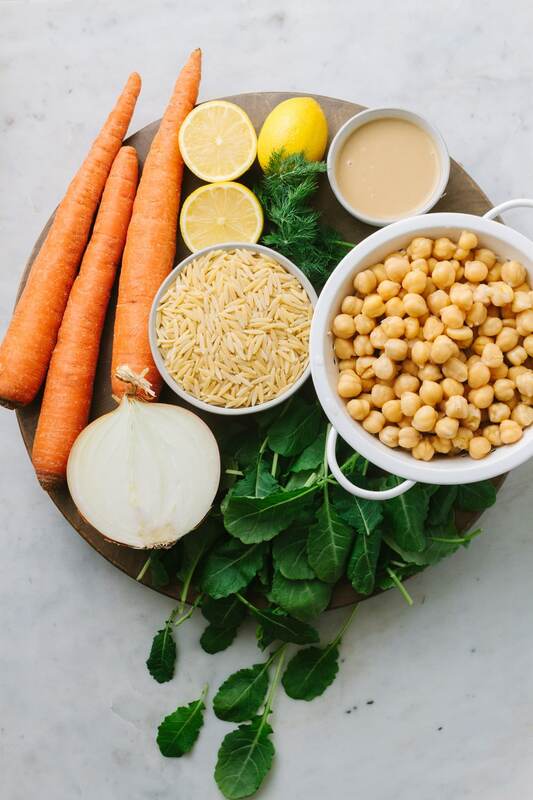 Add the broth or water, bring to a boil, add the orzo and chickpeas, reduce heat to medium-low and cook at a gentle boil for 7 – 8 minutes. Remove from heat, add tahini and lemon juice, stir well. Add the baby kale or spinach, give a good stir, greens will soften and wilt within a few minutes. Add as much dill as you like, and season well with salt & pepper. 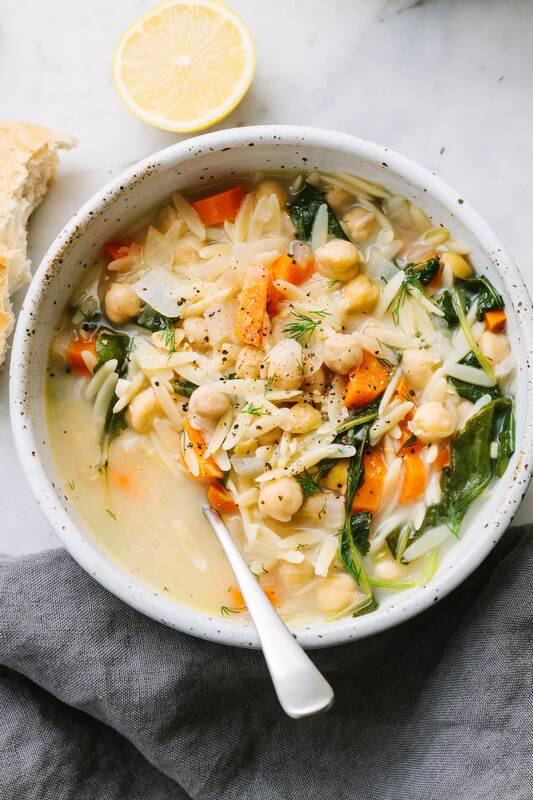 And that’s it, easy and delicious Lemon Chickpea Orzo Soup, ready in 30 minutes. Serve in individual bowl with your favorite crusty artisan bread for soaking up the wonderful juices! Get cozy with these other flavorful vegan soup recipes. They’re great all year round! If you try this orzo soup recipe, please let us know! Leave a comment and rate it below. I love to hear what you think, or any changes you make.